Home / Braces and Straighteners / Invisalign vs Braces: Which is Right for You? First impressions are important for forming long-term personal and business relationships. Surveys have shown that about one-third of Americans find the face to be the most important aspect for making first impressions. Having crooked teeth is something many people struggle with. 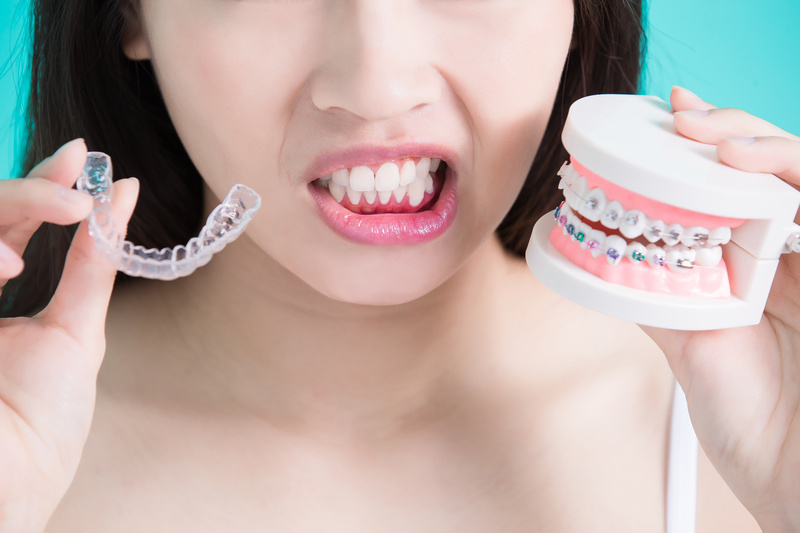 When it comes to straightening teeth, there are two major choices: Invisalign vs Braces. Despite their similarities, they aren’t the same and require different considerations. To make your decision clearer, we’ve gathered a list of pros and cons for each dental solution. Here’s how they stack up against each other. The most obvious difference between these two procedures, besides the aesthetics, is how they’re applied to the teeth. Invisalign is just a mold that goes over the teeth, while braces are bonded onto them. Invisalign is a type of retainer that can be taken off when needed. In fact, you’re only supposed to wear them for 22 hours out of the day. On top of that, you don’t keep the same aligners until your teeth are straight. You swap them for new ones every two weeks. This keeps the same level of pressure on the teeth throughout the alignment for about a year (longer for adults). Not all patients can opt for Invisalign due to other dental risks. Braces are adjusted on your teeth. You keep the same braces until alignment is complete and the wire is tightened gradually by the dentist. Besides the popularity and status quo associated with the newest treatment, Invisalign and braces are equally valid choices. The selection can come down to personal preference. These molds can be so accurate that many people do not even realize they’re there. From afar, they’re virtually undetectable. Up close, certain angles can allow light to betray Invisalign’s invisibility. The fact that Invisalign is removable makes brushing teeth an easy task. Putting them back in is not difficult and doesn’t hurt the teeth. The biggest con to Invisalign is the fact that it’s a mold that can harbor bacteria if not cared for properly. The number of adjustments can also be seen as a con. Having to return to the dentist much more frequently can be inconvenient. Braces have an inherent advantage of being able to make more precise adjustments. This allows treatment of crossbites, extreme gaps, malocclusions, and more. The pressure applied by brace wires is more direct and stronger. This brings us to the cons that stem from the stronger materials of braces. The ceramic brackets can irritate the mouth. Overbites can scrape against the bottom braces, wearing down the enamel. And, despite having clear braces, they can cause staining from the elastic wires. Based on your dental history and the circumstances of your realignment, your choice of Invisalign vs braces may not be obvious. This is without even accounting for the costs of the treatments. You have to do your homework and make the best decision with your dentist. If you need help figuring out which one is right for you, contact us today. Our highly-trained dental professionals can provide a free consultation to figure out how you can smile with confidence and live a better life.